Irish (generally known in English as "Gaelic") and English are the two official languages of the Republic of Ireland. According to the 2002 census, approximately 42% of the population of the Republic of Ireland are able to speak Irish, and the government is committed to the development of a bilingual society. This course includes eight lessons of Irish language instruction - 4 hrs of audio-only effective language learning with real-life spoken practice sessions. Each lesson provides 30 minutes of spoken language practice, with an introductory conversation, and new vocabulary and structures. Detailed instructions enable you to understand and participate in the conversation. Practice for vocabulary introduced in previous lessons is included in each lesson. The emphasis is on pronunciation and comprehension, and on learning to speak Irish. Irish and English are the official languages of Ireland. The three major dialects of Irish are: Connemara (in the west of Ireland and around the city of Galway), Munster (spoken in Counties Kerry and Cork), and Ulster (spoken in County Donegal). 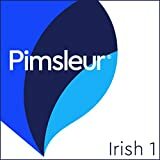 Pimsleur's Irish teaches the Munster dialect. Irish Gaelic, Complete Edition is a unique multimedia course that takes you from a beginner to an advanced level in one convenient package. At the core of Irish Gaelic, Complete Edition is the Living Language Method™, based on linguistic science, proven techniques, and over 65 years of experience. Our method teaches you the whole language, so you can express yourself, not just recite memorized words or scripts. Start speaking Irish Gaelic immediately using essential words and phrases. "Scottish Gaelic in Twelve Weeks" has been written both as a self-tuition course for beginners and also for use within the classroom. You may want to learn Gaelic because of a general interest in Celtic or Scottish history and culture, or because it was the everyday language of your ancestors. The cynical observer may wonder if the exercise is worthwhile, when only one and a half per cent of Scotland's population speak the language. However, Gaelic is far from dead; in some parts of the Highlands and Western Isles it is the everyday language, and it represents an important part of the United Kingdom's cultural mix. There are Gaelic-learning classes in almost every area of Scotland. Each lesson in the book contains some essential points of grammar explained and illustrated, exercises, a list of new vocabulary (with a guide to pronunciation, in International Phonetics notation), and an item of conversation. Speak & Learn Audio Scottish Gaelic is the fast, fun, and easy way to start speaking with confidence! Listen and learn over 700 words and phrases. Choose a subject to begin Speak & Learn! The Easy & Entertaining Way to Learn a New Language! CD 2 includes: At the Hotel * At the Restaurant * At the Post Office * Telephone Phrases * Shopping * At the Doctor * At the Pharmacy * & More! 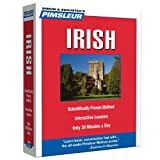 Learn Irish FAST with the Ultimate Irish Phrasebook for Travel and Beginners! 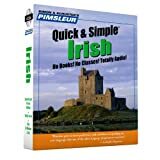 Now you can quickly and easily master more than 1,000 Irish words and phrases for travel and beginners with this breakthrough new book! Learn proper pronunciation with the included .mp3 audio lessons, and get prepared for your upcoming travels to Ireland! Pimsleur equals success. Just one 30-minute lesson a day gets you speaking and understanding like no other program. Irish Phase 1, Units 1-10 provide an introduction to Irish with 10 thirty-minute lessons . With this product you start from zero, learning first survival phrases and vocabulary, then progressing to speaking and understanding at a functional level. Every lesson contains an introductory conversation, and isolated vocabulary and structures, as well as full practice for all vocabulary introduced. Emphasis on pronunciation and comprehension. At the completion of this course, you'll have a basic vocabulary and speak with a near-native accent. This course provides you with a solid foundation upon which to expand your language skills. Culture Notes are provided to give you further insight into the Irish language and culture. A Notes booklet is also included in PDF format. Are you looking for a complete course in Gaelic which takes you effortlessly from beginner to confident speaker? Whether you are starting from scratch, or are just out of practice, Complete Gaelic will guarantee success! This new edition is fully updated to reflect the recently published spelling conventions. Extra online articles at: www.teachyourself.com to give you a richer understanding of the culture and history of Gaelic speakers. The course is available as a print book (9781444105919), as a pack comprising the book and double CD (9781444102369) and as a double CD (9781444102468). Whether you want to travel, communicate with friends or colleagues, reconnect with family, or just understand more of what’s going on in the world around you, learning Irish will expand your horizons and immeasurably enrich your life. Notes are provided to give you further insight into the Irish language and culture. A Notes booklet is also included in PDF format.